Another muffin recipe coming your way! The Blueberry Muffin, everybody’s favourite, now coming with a twist. ;) I am trying not be too boring so I added some cream cheese and a bit of blueberry jam to the “regular” recipe. Oh, and… I finished the whole tray the very same day. :) Enjoy! Preheat oven to 400° F / 200° C. Place paper liners on the bottoms of your muffin tray. If you don’t have paper liners, just oil or butter the tray well, so they don’t stick. In a medium bowl, mix together the flour, salt, baking powder and cinnamon. When you think everything is well incorporated, add the sugar and zest from one lemon, and mix them well again. In a separate bowl, mix vegetable oil, egg, milk and vanilla extract together. Next, slowly incorporate the wet ingredients (oil and milk stuff) into your flour mixture (flour, cinnamon, zest) but do not over mix. You can also add blueberries. Now get the cream cheese filling ready. In a small bowl, mix together the 3 tbsp cream cheese, 1 tsp lemon zest, and 1 tbsp sugar until smooth. Fill each cup half way through with half of the muffin batter. Next add 1 tsp of cream cheese filling into each cup and cover with the remaining batter. I also added about ½ tsp of blueberry jam as an experiment, and it really worked but it is totally up to you. In a bowl, mix together the flour, salt, baking powder and cinnamon. Add sugar and zest from a lemon to the flour mixture and mix them well again. In a separate bowl, mix vegetable oil, egg, milk and vanilla extract together. Slowly incorporate the wet ingredients (oil and milk stuff) into your flour mixture (flour, cinnamon, zest) but do not over mix. Add blueberries to the mixture. Get the cream cheese filling ready. In a small bowl, mix together the 3 tbsp cream cheese, 1 tsp lemon zest, and 1 tbsp sugar until smooth. Fill each cup half way through with half of the muffin batter. Bake these beauties for 15-20 minutes, or until muffins are golden brown and a toothpick comes out clean. Let them cool off on a cooking rack. 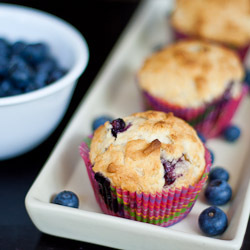 Nice recipe :) I love blueberry muffins… Such a great snack. This recipe looks lovely! I was wondering if you had the recipe in grams/mls – I am from England and I’m not too sure what cups are! Surething, 1 cup flour = 140g, 1 cup sugar = 200g, 1 cup milk = 240ml, 1 cup oil – 237ml. I think that covers it.